"Get counseling" is every advice columnist's go-to line — but it's a lot easier said than done. Today, we offer some tips on how to find a therapist — and how to afford one. If you have health insurance, start by looking at your insurance company's website. First of all, this will tell you if you need to call up and get pre-authorized for therapy. Don't let this freak you out or discourage you — yes, it can be a hassle, but it's often a simple phone call. And making it will insure that your visits are actually paid for. You should also check to see how many visits per year your insurance allows, as many companies impose limits. Next, your insurance company's website can help you find a shrink in your area. Many have a function that allows you to search for providers within your insurance network, and some will allow you to narrow your search by gender, specialty, or qualifications. PsychCentral has a helpful rundown of the different kinds of mental health professionals that may be listed on these sites. It can be helpful to know what all the letters after these people's names mean, but remember that the impressiveness of someone's degree doesn't necessarily correlate with how well they'll be able to help you. Once you find one or more therapists who might be a match for you, it can be a good idea to Google them. Online reviews of therapists are a hotly contested area, and I wouldn't necessarily suggest putting too much stock in them — but insurance websites aren't always up-to-date, and you want to make sure the providers are still practicing in your area. Also, some therapists will have websites that mention their approaches and areas of specialization. 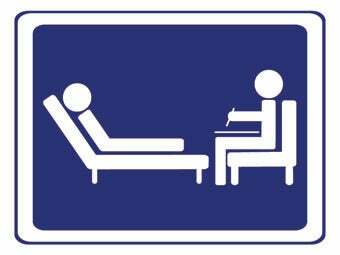 PsychCentral also lists (some of) the different therapeutic approaches — understanding the difference between, say, cognitive-behavioral therapy and interpersonal therapy can help you find the therapist that's right for you. If the therapists you're interested in don't have websites, it's fine to call them up and ask them a little about themselves — as long as they're taking new patients, they'll usually be willing to answer basic questions over the phone. Ask a doctor or friend for a referral. If you're not finding what you're looking for on your company's website, but you have a doctor you trust, you can ask him or her for a referral to a mental health professional. Some doctors' offices keep referral lists for this kind of situation, though as with insurance company websites, you'll need to check and make sure the info is up-to-date. Also, be aware that your doctor won't always know if the therapists on the list take your insurance. If money is an issue, look for therapists with sliding scales. If you don't have insurance, or if you've exceeded your maximum number of visits for the year, therapists' fees can be really steep. But some shrinks may give you a break based on your income. A doctor or another therapist may be able to refer you to someone who offers a sliding scale, and sometimes therapists' websites advertise this offering. However, many therapists have limits on how many reduced-fee patients they can see, so you'll need to check and make sure they can accommodate you. Consider community mental health centers. If you can't find a therapist with a sliding scale in your area — or their fees are still too high — another option is a community mental health center. As John M. Grohol of PsychCentral (a goldmine of info about this stuff, which also has a searchable database of therapists) explains, these are government-subsidized facilities that offer therapy at lower rates than private practitioners. Grohol also points out that therapists at community mental health centers may be younger or less experienced than those in private practice, but that doesn't mean they can't help you — many really smart and dedicated people train at mental health centers. You may be able to find a community mental health center in your area through the Substance Abuse and Mental Health Services Administration or WhereToFindCare.com. Investigate universities in your area. Some university psych departments or medical schools offer therapy to the local community a reduced rates or on sliding scales (UC Berkeley is an example). Like community health centers, these programs may place patients with students still in training for their degrees. But again, these students are often intelligent, caring, and driven — and while it's not the best situation for everyone, being part of someone's training can actually be rewarding. After all, you're helping someone learn how to help not just you, but other people in the future. Look for resources specific to your situation. If you've been abused or assaulted, several organizations can help put you in touch with therapy providers, and possibly help you find therapy at a reduced cost. For survivors of sexual abuse or assault, RAINN operates both a crisis hotline and a website that can help you find counseling centers. If you're dealing with abuse, the National Domestic Violence Hotline may be able to help you find services in your area, including counseling. If you're struggling with substance abuse or addiction, you may be able to find a treatment facility near you through the Substance Abuse and Mental Health Services Administration website. Also, community centers and hospitals sometimes operate support groups geared to specific issues, which can be an option if you can't find an individual therapist or prefer a group setting. If you're part of a church or religious community, they may have resources as well. Get a friend or family member to help you look. Sorting through all the information on therapists and their fees can be daunting, and while some people prefer privacy in this process, for others it can be tough to manage alone. If the latter is true for you, consider asking a trusted friend or family member for help. This person most likely can't, say, argue with your insurance company for you — but he or she can help you search for providers, help you find info on health centers in your area, or generally give you moral support in your quest to get help. Sometimes mental health problems can be isolating, and it can be good to have someone to remind you you're not alone.